DEAD RAT IN A TRAP STATIC PROP - Trick or Treat! Give ‘em a real scare this Halloween with this RARE Collectible, Discontinued Out Of Production - DEAD RAT WITH WOODEN TRAP - Disturbing Haunted House Decoration. 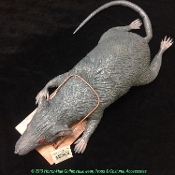 28-inch big foam-filled realistic gray latex rat, appears to be caught in removable brown wooden trap with metal spring. Approx 28-inches long from Nose to Tail. Actual body length from the nose to rear approx 16-inch, approx 7-inch at widest point. Made of foam filled latex.